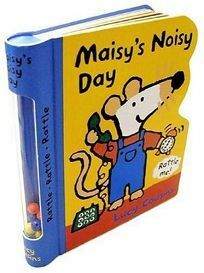 Preschoolers will enjoy the jingly-jangly fun in two Maisy books with built-in rattles, both by Lucy Cousins. In Maisy Likes Dancing, Maisy stomps, hops and twists with her friends. The rattle, bound into the back cover, is clearly visible on each page of this die-cut board book. Maisy explores sounds from knock knock to tick tock in Maisy's Noisy Day. The colorful rattle built into the spine encourages little ones to join in the noisemaking.